Real progress in the Pink Paradise. 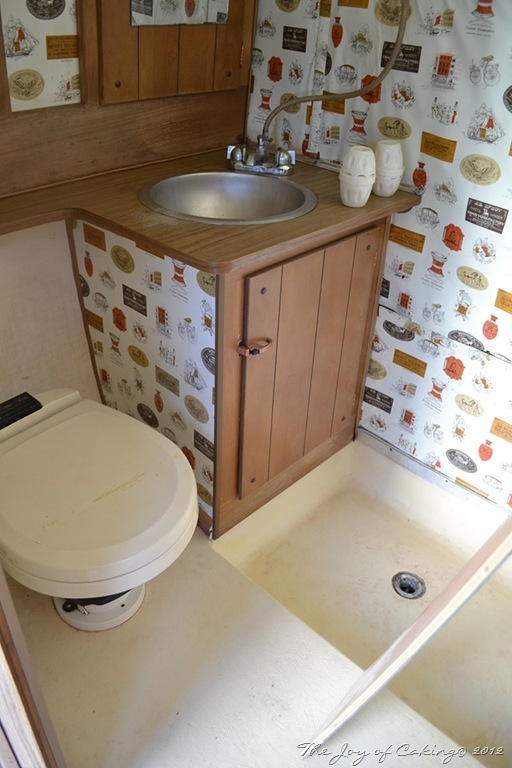 When I started this project I consulted with a couple that sells vintage travel trailers in our area. My big question to them was simple. Do I keep the travel trailer original, or change it to something more my style. 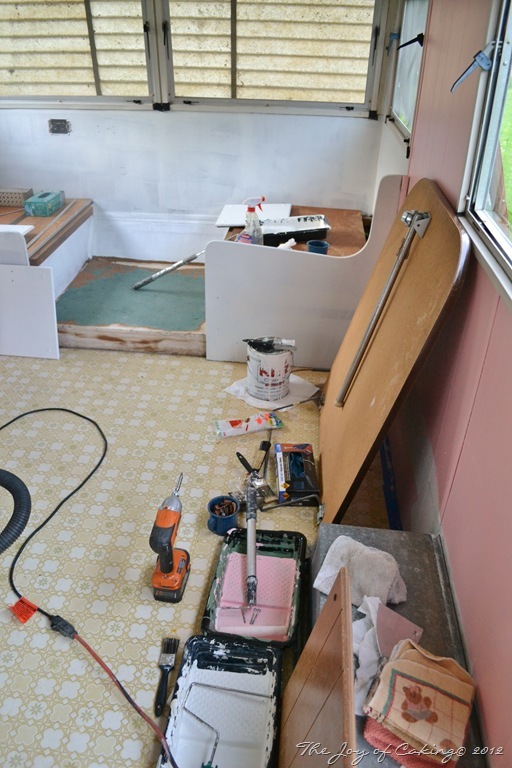 There weren’t any nice birch cabinets to refinish in this trailer so their reply was; change it to something you like. With that said, I have made some dramatic changes. 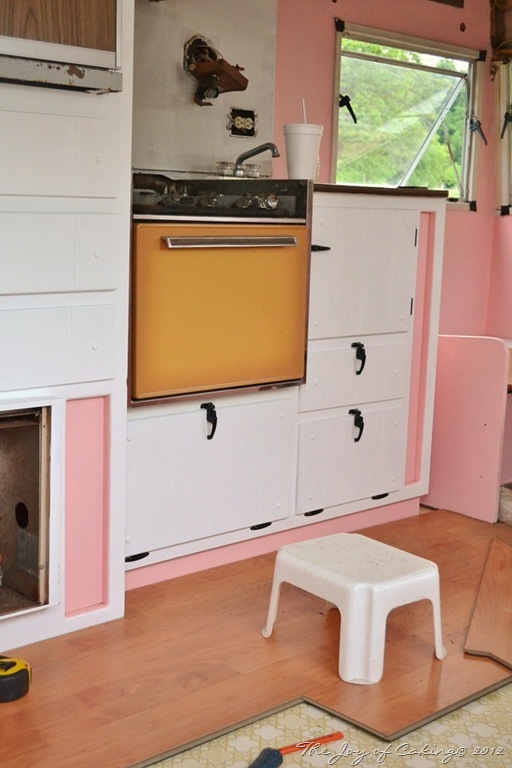 The biggest challenge is working around the color of the original stove/oven. I don’t want to replace it because it’s in excellent condition. I think I’ve got this challenge all figured out, but only time will tell. So, are you ready for a sneak peek? The bathroom before cleaning. I found a live baby mouse cleaning this out – cute, but gross! The bathroom after cleaning. Ahh… Much better! The major cleaning is done, and the persistent bees, mice and ants have been terminated, or have they? 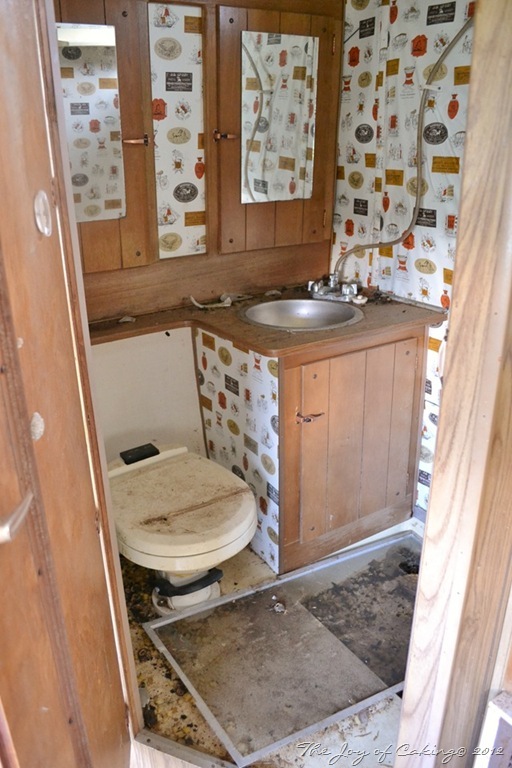 And the bathroom is slated for a remodel just in case you’re wondering. I had a nosey visitor stop by to check out my progress. 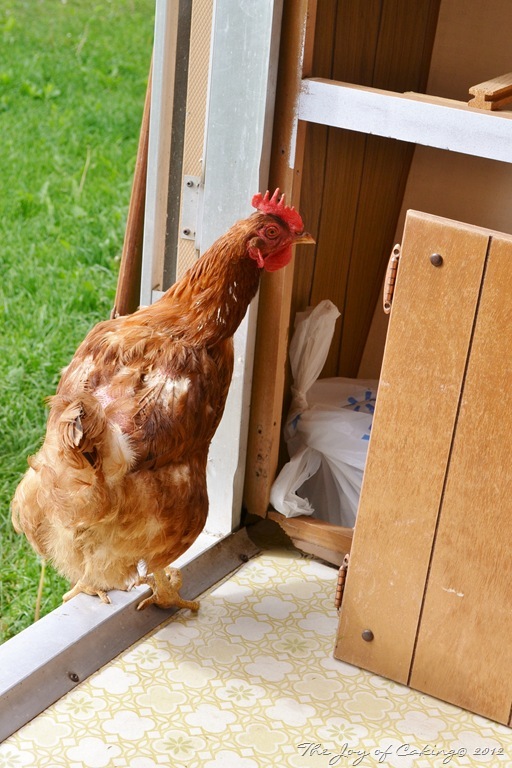 I think she was looking to see if I was planning on building a nesting box to accommodate her. 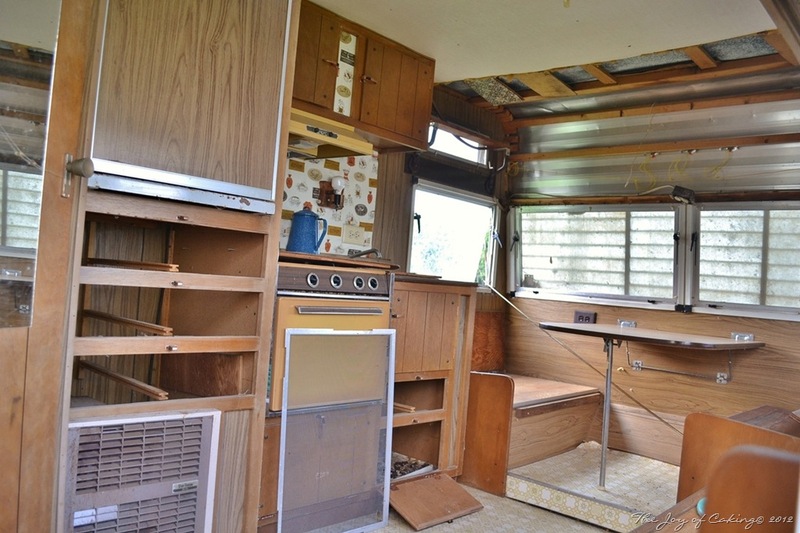 I removed a bulky plywood couch that took up entirely too much space in the trailer. That will be replaced with some type of seating to cover the wheel well. Still trying to decide exactly what. Ideas? No more bulky couch below. Do you notice the pink paint? I primed everything. That was a time-consuming process since I decided to use a non-latex based primer and this type of primer does not apply quite as easily. I also took all of the cabinet doors off, along with their hardware. I can tell you that working in such a small space didn’t help speed things along either. 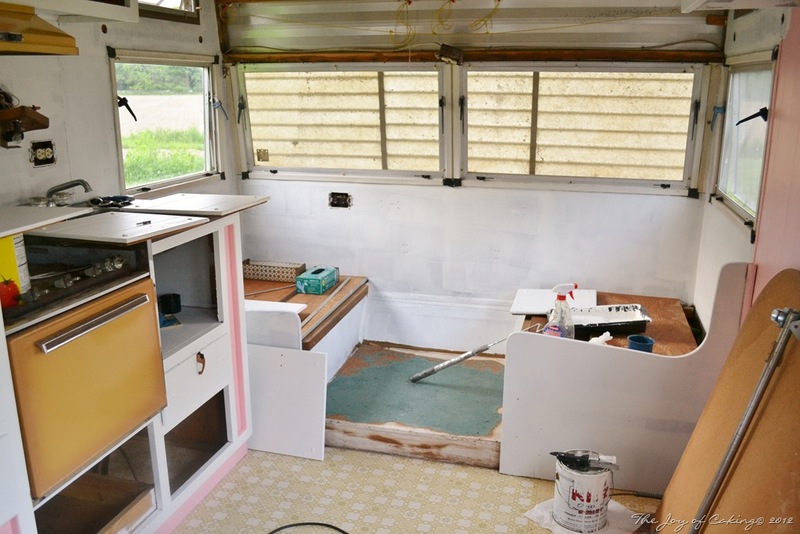 Remember the travel trailer before primer? 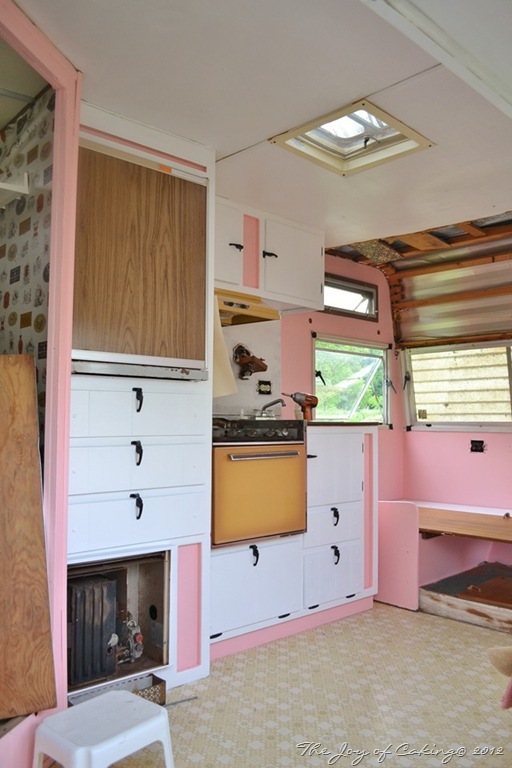 Look at the trailer after the primer, and with a touch of the pink paint. Below, I have put the first coat of paint on the ceiling, walls, cabinets, and door latches. 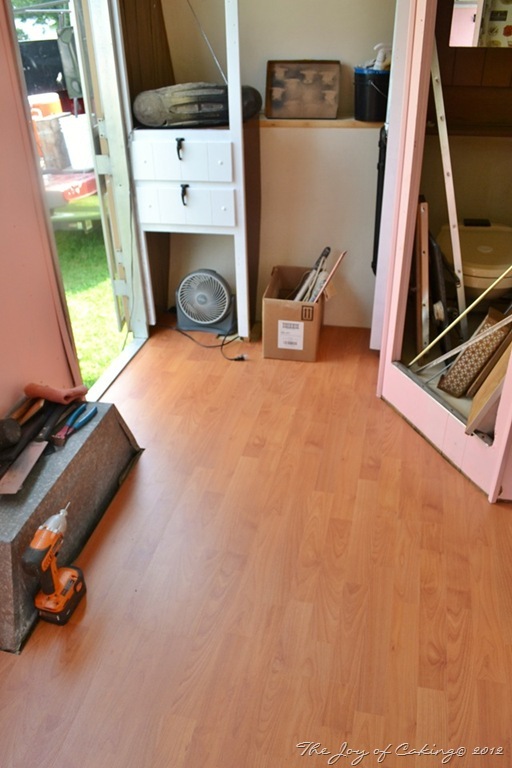 Below is a picture of the start of the cherry laminate floor installation. Hubby did the real carpentry work while I played carpenter’s helper. And lastly, here is the finished floor. What a transformation! There is still a lot more work to be done, but I’m really happy with the progress we’ve made. I promise lots more surprises. If you missed my first post about the Pink Paradise check it out here.